An old bookstore has been stripped back to its concrete foundations to create a minimal space for Swiss eyewear brand Viu's first store in Austria (+ slideshow). 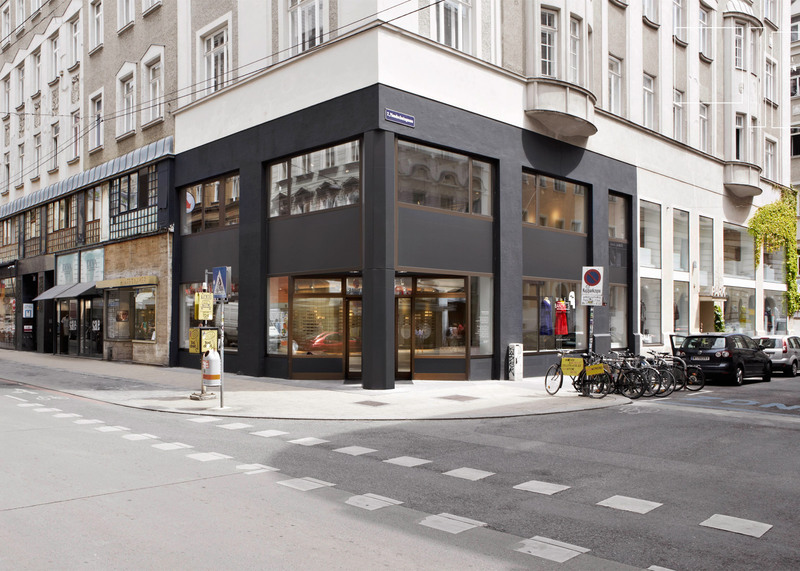 The store is located in the Neubau district of the Austrian capital which is known for its rich art history and bohemian culture. Viu shares its new two-story premises with We Bandits, a fashion store which specialises in Korean brands. Viu's creative director Fabrice Aeberhard was responsible for the interior design, and wanted to create a large open space where visitors could browse its glasses as though they are inside a gallery. 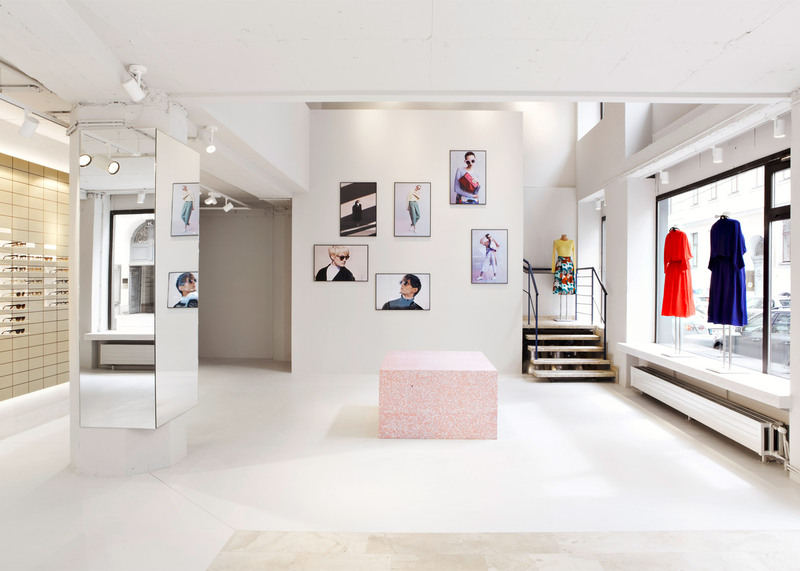 To begin with, the shop was stripped back to its concrete structure. Multiple inner walls that divided the space were removed, and the ground floor ceiling was opened up to the second floor. "Stepping into the store, one is struck first and foremost by the sheer size of the space," said Viu. "Visitors browse the pieces with the feeling of being in a gallery – the expansiveness of the space truly impressing and their eyes continually being pulled throughout the room to each new piece." 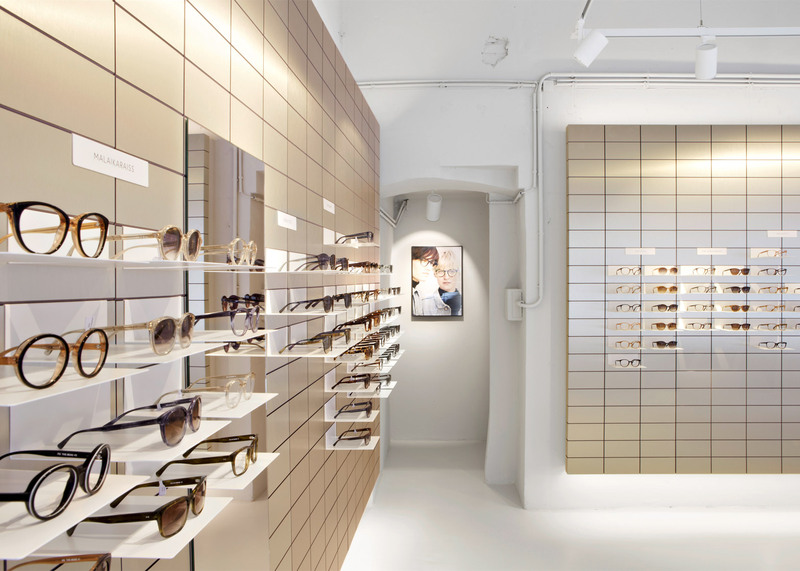 Eyewear is arranged on small shelves that slot into gridded display system constructed from anodised, brushed aluminium towards the back of the store's ground floor. This is mounted to sit slightly proud of the original walls, with lighting hidden behind to illuminate the gaps above and below. A high table in the same material with bar stool-like seating provides visitors with a place to sit and try glasses on. 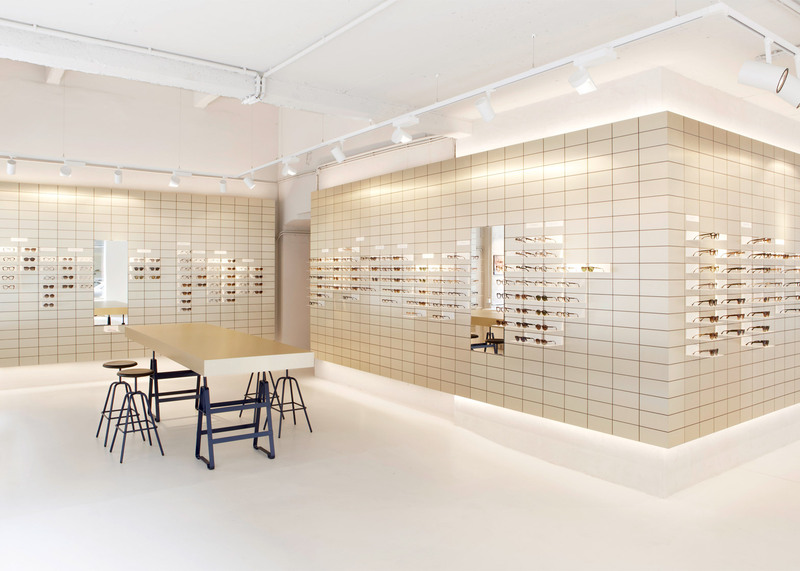 "Taking a back seat to the overall layout of the space, the eyewear wall does not stand in contrast to the immensity and visibility of the entire space, but rather complements it, begging a second, more detailed glance as with an exhibit or work of art," said Viu. The gold tones of the wall complement terrazzo pastel-pink details found throughout the store, including a seating podium in the atrium. Towards the front, a sculptural bench gives customers another place to sit. Large shop-front windows bring in natural light and adjustable spotlights are used to highlight key features as well as provide further interior lighting. Viu is a Swiss premium eyewear label which focuses on sustainable production. All the brand's acetate frames are produced by hand by a traditional Italian manufacturer. Other eyewear stores on Dezeen include a Montreal shop by La Shed Architecture that is divided into black and white areas and a shop in Amsterdam by Occult Studio that features pegboard walls.